It&apos;s time to sip and savor on authentic Texas wines! This one-of-a-kind event is a huge hit in Granbury, so mark your calendars for the 10th Annual Wine Walk, April 26-27, 2019! Wine-lovers from all over flock to Granbury year-round for the wine in the area (we have four wineries in the county! ), but the Wine Walk is a special event in itself where dozens of wineries head to the Historic Granbury Square. The event kicks off Friday, April 26 and again, Saturday, April 27. Wine Walkers can enjoy live local music at clusters of booths, each cluster offering Texas flavors in wine, food and art. The community gets into the spirit, as well! The celebration begins with the prominent VIP “Sip & Savor” Event on Thursday evening, April 25. The VIP typically sells out! Attendees enjoy a taste of Texas with hors d’oeuvres from North Texas’ favorite celebrity chefs paired with carefully selected wines from wineries at the Wine Walk. The Granbury Wine Walk is a non-profit event benefiting local charities. 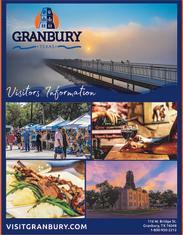 Plan your Granbury getaway today! Find your perfect lodging for this year&apos;s Wine Walk event. Learn more and purchase tickets here.